Minor Key Ear Training is a subject that comes up often and this blog post is dedicated to some of the 1st steps you can take to fix this problem. It’s true that a lot of students have problems with minor keys. They either have a lot of problems hearing One Note Ear Training in a minor key or they always hear a minor chord as a relative minor. 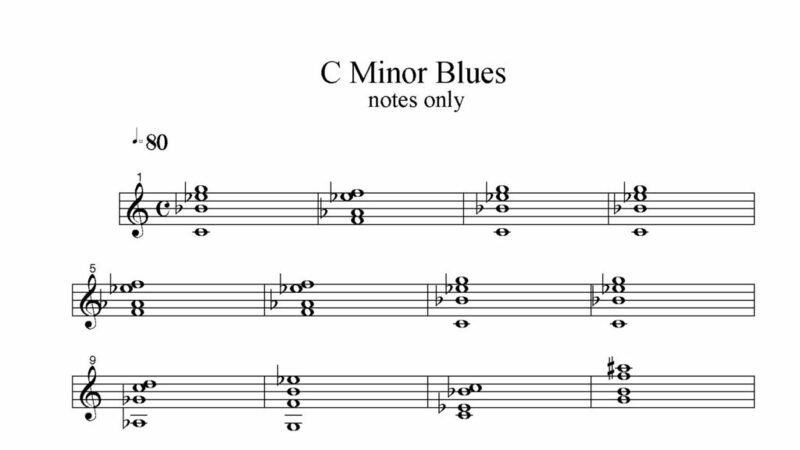 Example: when an A minor 7 is played, they hear “C” as the root. I find this most often with musicians who have a strong classical background, and also with students that don’t have a lot of experience listening to or playing contemporary styles such as Jazz, Blues or Rock. Fixing this issue can be difficult, and the best thing is to stay in contact with me as I recommend different exercises and courses to fix this problem. Almost always, a student needs more experience hearing and playing along with minor key progressions to improve their aural recognition skills. 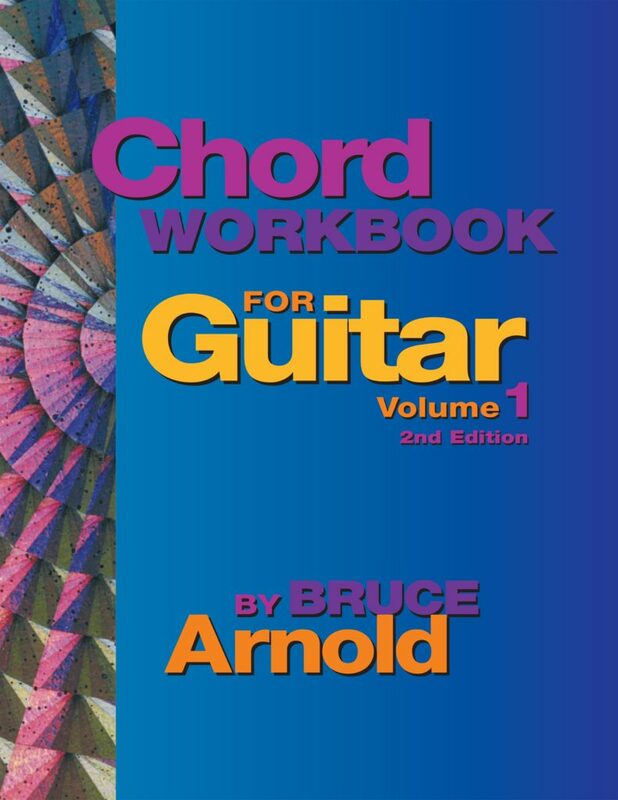 For this I recommend the Chord Workbook for Guitar Volume One, because it comes with audio files so you can hear the chord progressions at 3 different tempos. The book includes both chord charts and exact chord voicings for each progression. 1. First some background information. 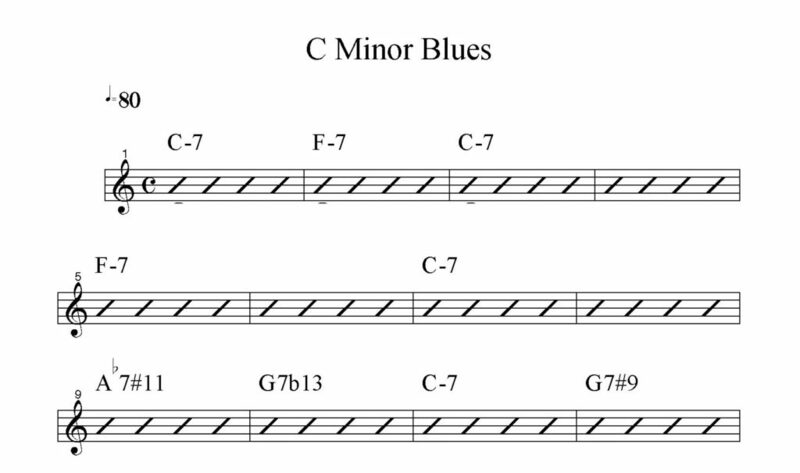 Go to page 137 and look up the chords for the C minor blues progression. Notice that many of these voicings are “drop 2” i.e. Drop 2 chords (or drop 2 voicings) and that means taking a closed-position (closed position means that it is stacked up 1,3,5,7 etc.._) chord and dropping the second-highest note down an octave in order to create an open-position chord. See if you can play these chords on a piano or guitar or arpeggiate the chords. Have a MetroDrone going in the background when you play these chords. 2. Listen to the MP3s that come with the Chord Workbook for Guitar Volume One so you can hear how these voicings sound and hear the minor key center. a. Arpeggiate the chords on your instrument but also sing these chord voicings using the notes as seen below or on page 137 of Chord Workbook for Guitar Volume One,. In some places you many need to leave out the lowest note because of the range of your instrument or voice. These guide tones can be used to improvise, so use the structure above as a template and then mess around with adding a few notes here and there both as a technique on your instrument as well as for your voice. Start with 1/2 notes and whole notes then start changing the rhythm. I would take one or two progressions a week. Some will be harder, like the Ab Minor Blues and you may spend a week just on that progression. I’d spend about 15 minutes writing out a guide tone line and playing it, then improvising around it each day. I’d also read through the chord voicings and arpeggiate the chords, which will probably take a minute or two. 4. Also get the Direct Application CD Volume Two Dorian and listen twice a day for 5 minutes to the One Note Ear Training with the Dorian key centers.